We are very fortunate to continue our work with Dr. Bridget Cantrell. Dr. Cantrell serves as a volunteer member of the Warrior Support Team and helps provide resources and information to warriors, their family members, and their caregivers. 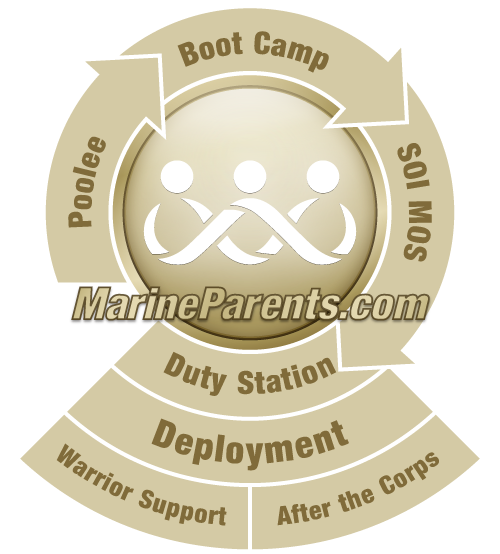 Dr. Bridget Cantrell has been volunteering with MarineParents.com since 2006. She is an expert on Post Traumatic Stress (PTS) and the author of four books on the subject of PTS with combat warriors. Dr. Cantrell was named the 2004 and 2008 Outstanding Female Non-Veteran for her service to veterans by the Governor's Veterans Affairs Advisory Committee and the Washington State Department of Veterans Affairs. In 2008, she received the Didi Hirsch Foundation Leadership Award for Erasing the Stigma of Post Traumatic Stress Disorder (PTSD). Dr. Cantrell has her Doctorate of Philosophy in Clinical Psychology and is a private practitioner. She is one of a small number of specially selected and trained mental health providers for the Washington State Department of Veterans Affairs PTSD Program, under the supervisor Thomas Schumacher, MS Director. She is also a provider under the Mental Health Fee Service Program, Puget Sound Veterans Health Care System (Seattle VA Medical Center). Additionally, she holds various contracts in the state of Washington, one of which is the Vet Center Contract, which enables her to see combat veterans. Dr. Cantrell is also an honorary member of the Red Feather Society, a nationwide Native American Combat Veterans' association. This honor is a result of her work on behalf of, and dedication to, combat veterans. She has also been extensively exposed to the understanding and meaning of Native American ceremonial rituals, which offer an alternative approach toward combat trauma recovery. She has worked with veterans for nearly twenty years. Specializing in trauma for several years, Dr. Cantrell's primary work now encompasses treating war veterans from all eras, as well as their family members. Additionally, she works with veterans who have been sexually abused while serving in the military. In 2003, she received the "Highest Productivity" award for the Washington State Department of Veterans Affairs (WDVA) PTSD program. Dr. Cantrell's dissertation research, entitled "Social Support as a Function of PTSD within Washington State Vietnam Veteran Populations," was presented to the Washington State Senate Select Committee for Veterans as part of the Governor's Master Plan for the needs of veterans. Her research included a five-site sample of Vietnam veterans' bio-psychosocial needs that was used for planning future programs for the King County Veterans Program. Dr. Cantrell's research findings were formally presented at the European Traumatic Stress Conference, in Edinburgh, Scotland. She was also invited to present her study in Brisbane, Australia, at the Brisbane International Traumatic Stress Conference, as well as at the International Society of Traumatic Stress Studies meeting in New Orleans, Louisiana. In the Spring of 2004, Dr. Cantrell was formally invited by the U.S. Army to provide mental health services to the paratroopers of the 173d Airborne Brigade stationed in Vicenza, Italy. While there, she focused on helping these troops reintegrate with their loved ones and readjust to peacetime conditions after their prolonged combat exposure in northern Iraq. Information and observations from working with the Operation Iraqi Freedom veterans gave birth to a new workbook course entitled Turning Your Heart Toward Home. This course was followed by the co-authored book Down Range: To Iraq and Back, which now has more than one million copies in print. In her latest co-authored work, Once a Warrior: Wired for Life, Dr. Cantrell takes readers on to the next step in the process of coming home and reintegrating when a tour of duty is finished. This book focuses on how to once again become a civilian after being trained for military duty. Dr. Cantrell's third book, Souls under Siege: The Effects of Multiple Troop Deployments—and How to Weather the Storm, helps us all find ways to support and tend to those living under the pressures of multiple deployments. Its thrust is to not only expand awareness of the issues involved, but to also outline sensible tools for finding relief in these trying times. Souls under Siege is not a book to sit idle on your shelf. It will become a useful guide to be used over and over again. Once a Warrior: Wired for Life-an Interactive Workbook, comes alive and takes participants on the next step from theory to practical application. Following closely with the concepts of her book Once a Warrior: Wired for Life, Dr. Cantrell has formulated this interactive guide in fifteen practical steps. It is an easy-to-follow workbook course geared to assist military personnel in utilizing their tremendous potential in achieving success and happiness after military service. It highlights a successful path on the journey from warrior to civilian. Dr. Cantrell is frequently under contract with the Department of Defense to provide her workshops and lectures to military bases all over the U.S., Japan, Okinawa, and Italy. She also provides community-oriented lectures to inform the civilian sector on how to best assist our men and women in uniform and their families. Dr. Cantrell is a member of the American Psychological Association (APA), Association of Traumatic Stress Specialists (ATSS) and The International Society of Traumatic Stress Studies (ISTSS). Currently she is the Founder and CEO of Hearts Toward Home International, a charitable non-profit organization dedicated to the recovery and reintegration of trauma survivors. Her non-profit organization, Hearts Toward Home International, has been recognized and given the Best of Bellingham Award in the Non-profit Charitable Organization category by the U.S. Local Business Association (USLBA). Dr. Cantrell is a licensed Mental Health Counselor in the State of Washington and a nationally board-certified Mental Health Counselor. Presently, she provides mental health services to active duty from all branches of the military, reservists, and Guard troops and their families. This work focuses on treating military personnel who have experienced combat exposure or trauma, family deployment stress, and readjustment issues after coming home. She assists family members in supporting themselves and their deployed loved ones. Dr. Cantrell is also involved in veteran advocacy at the Federal and state level to uphold the rights and ensure proper treatment of veterans. She serves on the board of several veteran organizations. Dr. Cantrell also trains first responders (law enforcement, firefighters, EMTs, hospital personnel, etc.) to better understand their role in the success of our warriors with whom they come in contact. She also works with educational institutions and prospective employers to assure that our veterans are treated fairly and with the care and respect they deserve in order to succeed in the civilian sector. She is also an expert witness for court cases for our military service members and civilians. Dr. Cantrell serves on several boards and frequently participates in panel discussions regarding the rights and needs of our veterans and active duty military members. Dr. Cantrell has appeared on television news programs on CNN, FoxQ13 Seattle, and several other television networks. She is a frequent guest on numerous radio broadcasts, internet programs, and in military chat rooms where she serves as an expert in the field of combat trauma and PTSD recovery. She was recently featured in a documentary focusing upon the challenges of our female warriors. She also filmed a television pilot, which presented interviews of returning troops and her perspective on these adjustment issues. She focuses on the current issues our troops and their families face before and after their deployments, such as PTSD, TBI, and a multitude of adjustment challenges associated with military service. Dr. Cantrell is involved in several groups that recognize and honor the sacrifices of veterans. She has participated with various community veterans organizations such as Combat Veterans International, a national motorcycle group of combat veterans, the Run for the Wall (Rolling Thunder) Memorial Ride from California to Washington, D.C., and The Traveling Wall. She offers support and is actually on call for her local veterans community. She is regularly asked to speak at stand-downs, events for veterans, and tribal functions. Dr. Cantrell travels extensively around the globe teaching and lecturing to military personnel, including leaders, chaplains, medical and mental health practitioners, as well active duty troops who are in and out of Iraq and Afghanistan and their families, regarding the different aspects of the deployment cycle and reintegration. Her workshops have been given in both the European and Pacific duty assignments. You may contact her directly to schedule a time when she can work with your unit or organization by calling (360) 714-1525 or emailing bc@bridgetcantrell.com. Dr. Cantrell lives in the Pacific Northwest, where her office is located.